Black, green and many other teas are made of leaves from the plant Camellia sinensis. How the leaves are processed is what characterizes the differences among most teas. In general, most teas contain similar caffeine levels, which are usually lower than that of coffee. Brew time accounts for the primary influence over a tea's caffeine content. Researchers from the University of Florida examined the caffeine content of a variety of commercial teas and published the results in the October 2008 issue of the "Journal of Analytical Toxicology." The team found that one-minute brew times yielded at least 12 milligrams of caffeine for black tea and 14 milligrams for green. Three-minute brew times yielded a minimum of 22 milligrams for black and 27 milligrams for green. Lastly, brewing for five minutes resulted in a maximum of 61 grams for black and 41 grams for green tea. Exact caffeine content is difficult to pin down due to mediating factors such as brew time, infusion method, serving size and whether you drink the first or second infusion. However, in general, an 8-ounce serving of black tea brewed for three minutes contains roughly 30 to 80 milligrams of caffeine, according to the Center for Science in the Public Interest. 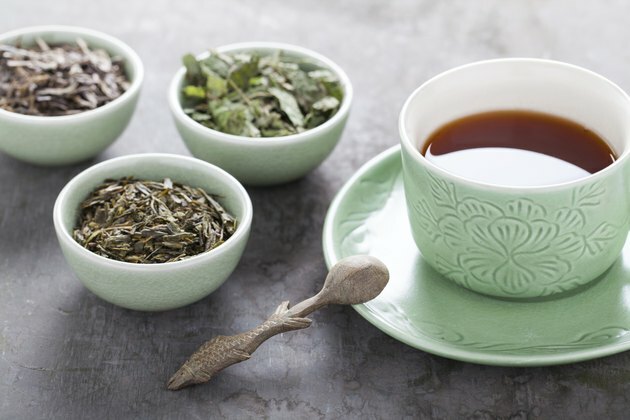 In comparison, an 8-ounce serving of green tea brewed for three minutes contains about 35 to 60 milligrams of caffeine. How Much Caffeine Is in Yorkshire Gold Tea?